Motorcycle theft is reduced to zero in Westminster ‘hotspot’. Motorcycle thieves are now avoiding St James’s Square in London, thanks to a series of anti-theft initiatives. The Square was identified as one of four ‘hotspots’ for motorcycle theft by Westminster City Council, with around 52 motorcycles or scooters stolen each year from its parking bays – around one a week. £1 million worth of motorcycles, scooters and mopeds have been stolen from the whole of the City of Westminster since April 2014 – a total of 191. Since September though, none have been taken from St James’s Square, as a result of a series of measures put in place by Westminster City Council through working in partnership with the Metropolitan Police and security marking specialists Datatag. This could be rolled out to other ‘hotspots’. 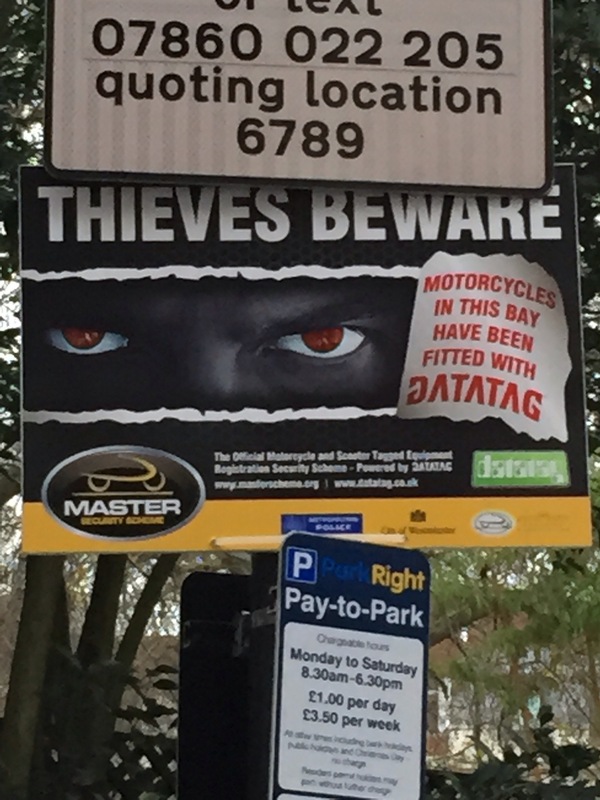 Westminster City Council and Datatag advertised a day in September to offer riders the chance to get their motorcycles security ‘tagged’ on site for just £50, including fitting. This resulted in a steady queue of riders taking advantage of this offer. Tagging involves applying a combination of highly visible and hidden security markers, which deter thieves but also help the police recover vehicles if they are stolen. Fitting takes around 25 minutes to complete. The Metropolitan Police were also on hand to check the Police National Computer to make sure the bikes weren’t stolen in the first place. After the tagging took place, warning signs were put up to let thieves know that users of the parking bay had security marked their bikes. “We are determined to reduce motorcycle theft in the City of Westminster and to give parking customers the best possible experience, which includes coming back to find your bike where you parked it. We have applied a combination of measures in partnership with the Metropolitan Police and Datatag, which alerts riders as to the risk and gives them the means to avoid them. “We aim to repeat the opportunity for riders to have their motorcycles and scooters marked in the New Year for riders who use Berkeley Square parking, as we feel this provided a turning point in St James’s Square, which we would like to repeat for other theft ‘hotspots’ in the City. Steve Kenward, CEO of the Motorcycle Industry Association, which invented the MASTER* Security Scheme – the UK’s first national, official tagging scheme for new bikes, says this concerted effort by Westminster City Council proves that marking works. “We are delighted to hear the part security marking is playing in eliminating theft in St James’s Square and applaud Westminster City Council’s systematic approach in dealing with it and would like to see other London councils making such an effort. “The underlying message gained from this exercise is that thieves like easy pickings. Make it as hard as possible for them to steal in the first place and if they do, make sure your bike is marked. This makes it easy for the police to secure a prosecution when they find a stolen motorcycle or scooter and helps them return it to its rightful owner. “Riders who don’t want the inconvenience of having a motorcycle or scooter stolen have a number of options. They now have a huge choice of new bikes which are automatically MASTER tagged, and they can have older bikes security marked retrospectively. We feel this is clearly acting as a huge deterrent to thieves, who are switching their attention to unmarked bikes. Thieves are looking for easy pickings, so make sure your bike doesn’t fall into that category. Westminster City Council has since added 78 ground anchors to the parking bay, which offer an additional highly visible deterrent. When riders secure their bikes to anchor points it makes it difficult for thieves to just lift up a scooter or motorcycle and put it into a van – a common way for thieves to steal an unsecured bike. Over the past few years an average of 24,000 motorcycles have been stolen annually in the UK, half of which are taken from London streets, with motorcycle theft in Westminster accounting for 55% of all vehicles stolen. This is becoming much less of a problem for newer bikes, as most major manufacturers have signed up to the MASTER scheme, which means bikes are tagged from the beginning. The MASTER scheme was developed two years ago with Home Office backing, in conjunction with the Metropolitan Police force and with support from the Association of Chief Police Officers. Over 70,000 new motorcycles and scooters have now been protected and registered with the MASTER Security Scheme since January 2013. First year figures for the scheme show that between January 2013 and January 2014 only 185 MASTER tagged motorcycles were stolen across the whole UK. 31,000 new motorcycles were protected by MASTER Scheme during this period, which represents a theft rate of 0.6%, compared to an historic rate of 2.4%. Unfortunately the problem is shifting to unmarked bikes. Motorcycles or scooters which are unprotected by security marking or any visible means of security are now far more likely to be stolen than those which are protected. This entry was posted in automotive, This and That and tagged anti-theft, chrismacgowan, christopher macgowan, MASTER, motorcycle, St James's Square, Westminster. Bookmark the permalink.